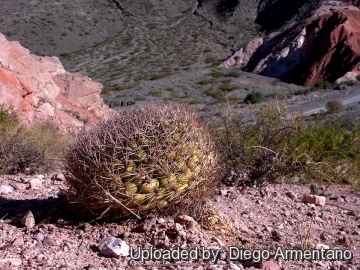 Origin and Habitat: Gymnocalycium saglionis has a wide range and is locally abundant in Argentina (Jujuy, Catamarca, La Rioja, Salta, San Juan, Tucumán). It was Originally found in Dept. Trancas, ca. 12 km al norte de Tapia en la ruta 9 a Vipos, 700 m, Tucumán. Altitude range: 240 to 2,600 metres above sea level. 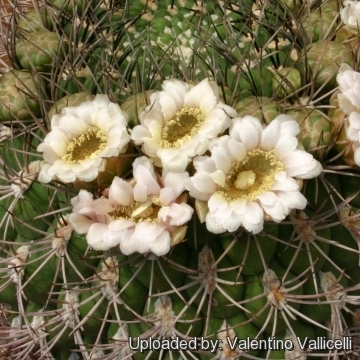 Habitat and Ecology: This cactus grows on rocky hills within monte and chaco habitats together with Echinopsis leucantha, and Trichocereus terscheckii. This species is common and abundant. It is present in several protected areas and there are no majorare no threats affecting it. 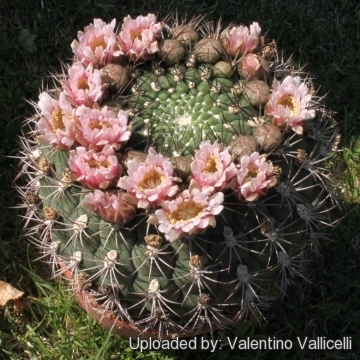 Gymnocalycium saglionis var. jujuyense Backeb. 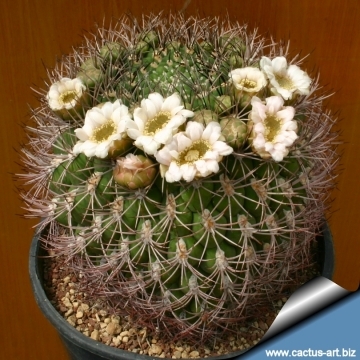 Description: Gymnocalycium saglionis is a solitary barrel cactus, rather flattened, often very large, with long spreading and sometimes recurved spines. They are a rich brown and form a pleasing contrast against the grey green body. Stem: Flattened globose to shortly cylindrical more or less flattened up to 30 (40) cm in diameter, 15-30 cm tall occasionally up to 90 cm tall, dull-green or blue-green. Apex spineless. Ribs: 10-32 according to the size of the plant, low, very broad, sometimes 4 cm. long, separated by wavy intervals, divided into large, low, rounded tubercles. Areoles: About 2 to 4 cm apart, large, felted when young. 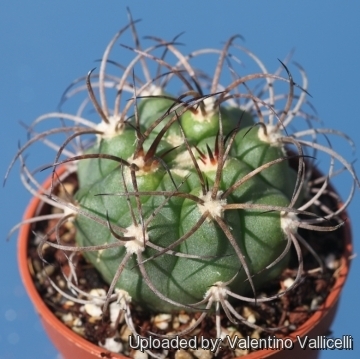 Spines: 8 to 10 on small plants but on old plants often 15 or more, 3-4 cm long, yellowish-brown, reddish or black becoming grey with time which contrast well against the green body at first ascending, afterwards more or less curved outward. Radial spines: 10-15 bent against the stem. Flowers: Broadly funnelform, white or pale pinkish, with reddish throat up to 3-4 cm long, 2-3 cm in diameter, with a very short flower’s tube; inner perianth-segments spatulate, acute; scales of the ovary nearly orbicular, rounded, with a scarious margin. The flowers forms a crown on the plant apex and have a hard time coming through the dense mass of spines. Blooming season: Appearing repetitively during the growing season. 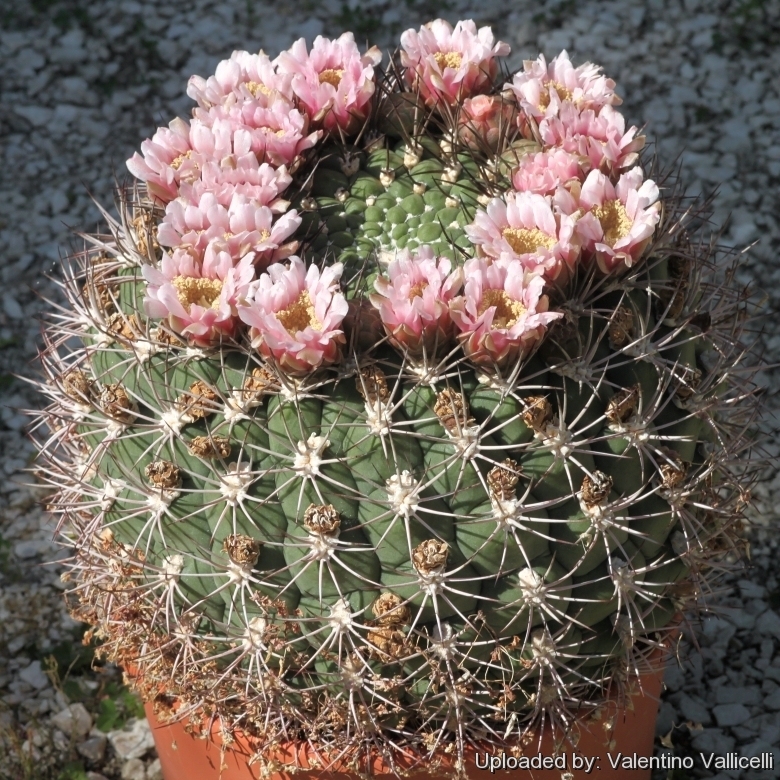 Gymnocalycium saglionis (F.Cels) Britton & Rose: This is by far the biggest among the Gymnocalyciums, can grow to 90 cm tall! Gymnocalycium saglionis f. cristata hort. : This crested form can reach impressive dimension. 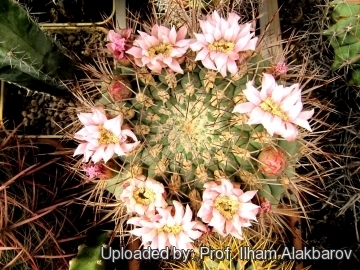 Gymnocalycium saglionis subs. tilcarense (Backeb.) H.Till & W.Till: Form huge balls with large tubercles and long, arching spines. Origin: Dept. Tilcara, Quebrada de Humahuaca. Gymnocalycium saglionis f. variegata hort. : variegated form. 6) Ortega-Baes, P. & Kiesling, R. 2013. Gymnocalycium saglionis. The IUCN Red List of Threatened Species. Version 2015.1. <www.iucnredlist.org>. Downloaded on 06 June 2015. Cultivation and Propagation: Keep this plant almost dry in winter at a minimum temperature of 0°C, prefer a low pH compost otherwise growth will stop altogether. The plant tolerate extremely bright situations but are likely to suffer from sun scorch or stunted growth if over exposed to direct sunlight during the hottest part of the day in summer. Since they are big sized plants need plenty of space for their roots, repotting should be done every other year or when the plant has outgrown its pot. 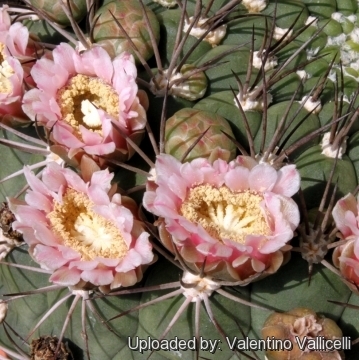 This species makes a great landscape cactus in moderate climates. Use and Trade: The fruits of this species are edible and used to make jam. 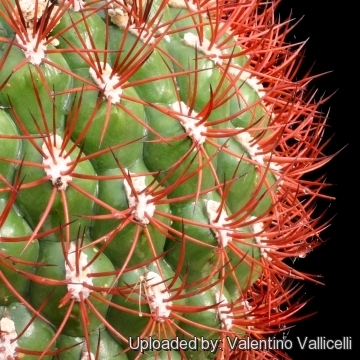 This cactus is also used as an ornamental. There are a total of 14 Photos.